Last May, I talked about how I bought my pants on eBay. Long story short, so you don’t need to click on the link, the GAP stopped offering the style of jeans that I’d been wearing for years and eBay came to the rescue — at a MAJOR discount. It was all good. Now, though, it’s been nearly 3 years since the GAP offered my style… The result? So, since I’m now in near desperate need of a few new pairs, I had to find something more practical — and because I’m not longer of the mind set that jeans need to cost big bucks to fit right (or perhaps I just don’t care any more), I went to Macy’s. 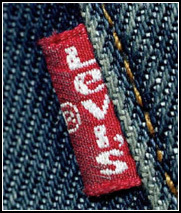 Yep, fifteen minutes and $89.97 later — I had 3 new pairs of Levi’s 569 jeans. I used to pay more than that for one pair of jeans!? Simply put, for under $100, my lower half is all set until at least 2011. Did you get 3 different “styles” or 3 identical pairs?